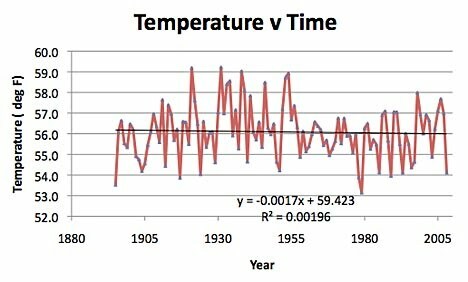 On Saturdays I have started looking at the temperatures of different states, as they have changed over the past hundred years. In February I started with Missouri which, apart from being where the current center of the population of the United States resides, happens to be where I live. 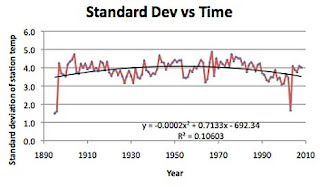 Having been an experimental researcher for my professional life, I decided to see what the data really said, in light of the claims of both sides in the climate change debate. 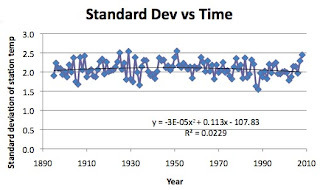 However, note that a subset of GHCN, the United States Historical Climatology Network (USHCN), has been adjusted via a homogenization intended to remove urban warming and other artifacts [Karl et al., 1990; Peterson and Vose, 1997]. Since one of the things that I was finding was that there remained an urban size effect in the data, even after homogenization, and that I did not know what the “other artifacts” were, it would have been nice to have access to the raw data. Well that information is now available. I did not use it, at the time I wrote the post about Indiana, since there are significant gaps in the data table provided. However, for today’s post I have gone back to Missouri, to see if the conclusions change, when raw data is used instead of homogenized. 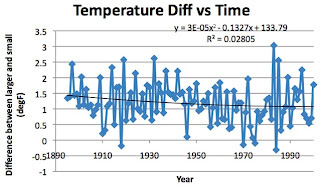 Basically what I have done, to make my life easier was to duplicate the Missouri data table, which I described forming back in the original post I then acquired the data for the RAW mean temperatures, as I described for the Indiana post, and just pasted them into the table over the original data. Doing it this way meant that the curves were already set up, and did not have to be created again. Then, because I want to be able to plot information from the two sets of data to seen what the differences are, I copied the entire data sheet containing the RAW data, and pasted it as a second sheet in the Excel file containing the original homogenized data. So that is where we start our investigation for the day. 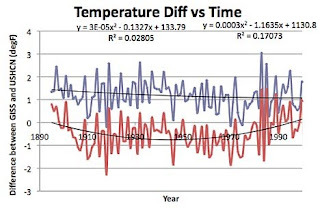 Now this second curve (with equation etc to the right) shows a much stronger correlation of temp diff with time, and that, starting in about 1970 that the temperature of the GISS stations rose much more rapidly than the USHCN stations, which is the suspicion that Chiefio had expressed. This is, however, only one state and we will see what happens as we progress through the rest. 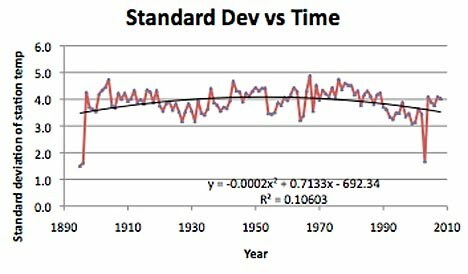 Instead of there being a steady (though minor) rise in temperature over time, there is a slight decline – not particularly statistically significant, but on the other hand significant in that the “homogenization” of the data takes a negative trend in the RAW data and adjusts it the other way. There are, in fact sufficient differences between the two sets of curves that the initial conclusions are not as strongly supported by the raw data. That, at this stage, is merely just worth noting since, for this sort of topic there is a need for much more data before stronger conclusions can be drawn. And so we will work back through the states, noting how the differences in data change the conclusions. And perhaps, after a while, there will be enough information to start to draw stronger conclusions. But for now I am going to finish this by posting the original plots derived from the “normalized” data with the raw data graphs set below them (with the addition of the longitude graph that I did not show the first time). Not quite as impressive a correlation, but again the scatter in the data and the form of the regression is still evident, so the conclusion stands, albeit more weakly. Hmm! Well it looks as though I got that wrong – it was heading the way I thought until the 1940’s and then it started to bend the other way. 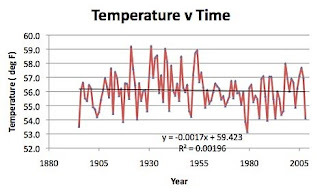 Apparently the change from glass thermometers to the automated Maximum/Minimum Temperature System (MMTS) started about then and the changing shape of the curve is perhaps indicative of the spread of the new system. And that conclusion hasn’t changed. 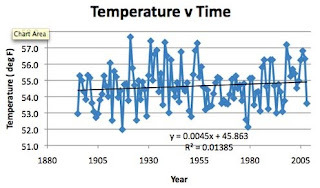 In all these graphs it should be borne in mind that Missouri has had a relatively stable climate over the past hundred and fifteen years or so. Now when the raw data is plotted, the scatter is reduced, but there are, consistently a couple of outlying data points that influence the correlation. So these are the raw data plots for Latitude and Longitude. And I’ll add a final plot to the set that wasn’t in the original, but later proved important (and explained some of the longitudinal variation) that of elevation, though this is a relatively flat state. So with some rather muddy results to start with, off we go on our trek again. This has been an interesting series of posts, HO. It is always good to see someone looking at the real data! 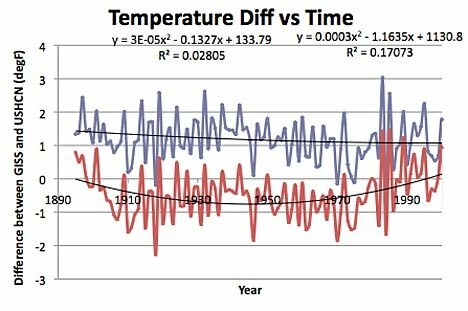 Your graph of temperature versus elevation suggests a trend of 5.2 Fahrenheit degrees drop per 1,000 feet increase in elevation, with quite a large scatter in the data. This compares with nominal adiabatic atmospheric lapse rates of 3 deg F per 1,000 feet for wet (100% humidity air) to 5 deg F per 1,000 feet for dry air. Would you describe Missouri as a low-humidity environment? Or are there other factors at work? Missouri, at the moment, is high humidity. Because I didn't look at elevation until I reached Kansas (which is going to be next - after I am done with MO) - and there is the interplay with Longitude since the Rockies are to the immediate West - I wanted to get a significant amount more information into the system before I do more than just very simple analysis.